My last doctor visit was Tuesday, Nov 23 and he just confirmed what I was told last week that the Bone Marrow Biopsy was excellent and that I am completely donor cells 🙂 Back to seeing the doctor every two weeks and still doing labs once a week. Another Bone Marrow Biopsy will occur Day +100 which should be around end of year, then a little bit after that I will probably get my central line removed. If everything tracks well, looks like I could go back to work starting in February. Interesting show on PBS Frontline called “Facing Death“. The show is about the high cost of end of life health care. The doctors and patients in the show are all from the Bone Marrow Unit. You can watch it online at the link below, or it will probably be repeated on TV. If you watch it online, go to chapter 3 called “The Great Uncertainty” which is about 18 minutes into the show. The patient talking had the same thing I had, MDS. The treatment the doctors talk about is pretty much what I went through, except I did not have radiation. And it appears these patients in show were much, much sicker at onset of treatment. I had my first post-transplant bone marrow biopsy on Friday, Nov 12. I was kinda loopy afterward as I don’t even remember waking up or getting wheeled back to car. And everybody told me later I kept repeating myself. Anyway, after some food and rest I seemed to have recovered nicely and have another little pencil scar in lower back. The results of my first post-transplant bone marrow biopsy are very good. My bone marrow is now completely “donor cells”! Now, the nurse explained that in medical terms “complete” means at least 95% converted, but that is what they are looking for. Furthermore, there are no signs of disease, no blasts, or other abnormalities. It just shows normal signs that I am still recovering. Otherwise, not much new going on. I really notice how easily I get chilled now without any hair as the days get cooler. Not sure how you bald guys keep warm 😉 I have taken to wearing my stocking cap even inside the house. I can tell new hair is starting to form, but still not much growth in length. Appetite is OK. When I eat, I eat pretty good but I still have the issue where I never really feel hungry. It is just an odd thing where my stomach is not signaling my brain that it is time to eat! Still have some odd tastes in my mouth and problems with chapped lips as skin keeps regenerating. Weekly doctor visit went fine. Numbers went up a little again as recovery goes on. WBC 5.0, Hemoglobin 11.7, Hematocrit 32.2, Platelets 128, ANC 3.5. This Friday is Bone Marrow Biopsy with preliminary results by next Wednesday. The doctor is changing office visits to every two weeks instead of weekly. I still go in once a week for lab work and to get my catheter dressing changed. 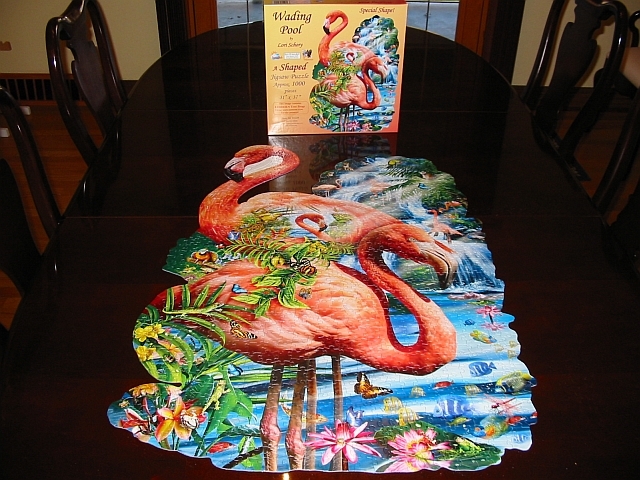 Finished the flamingo jigsaw puzzle. It was not too bad once I got the border done. I have another jigsaw puzzle to work on soon. Just a little update, I had my weekly visit with doctor on Tuesday and everything appears to be progressing as expected. The past couple weeks they have been adjusting my medication dosage as they do labs every week to monitor things. A bone marrow biopsy is scheduled for Friday, Nov 12, that will be the first real check to see how things are going. For those of you interested in numbers: WBC 4.2 (normal range), Hemoglobin 11.8 (below normal), Hematocrit 32.9 (below normal), Platelets 100K (below normal), ANC 2.2 (normal). Been home about a month now and you really start to get into a routine. My sleep is finally getting back to normal and I am not taking any sleeping medication. I think it is helping that I am trying to get up at the same time everyday and not sleeping 10-12 hours. Doing a lot more wash, not watching as much TV as you would think, and started one of my jigsaw puzzles. Some of you know that I am checking my work email a few times a day also. Next thing is to figure out what I will do for the 2011 Health Open Enrollment. Looks like I will go to buy up plan since I will have plenty of medical expenses in 2011. Probably will do the FSA also.